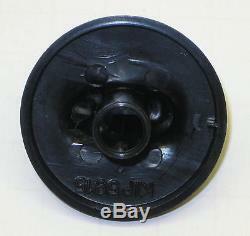 Up for Sale is a Knob Stock Number ER-71001641. This is New, Unused in the Package. It is Black in color. Off is a t 6o'clock, Lo is at 8 o'clock Med is at 10 o'clock & Lite Hi is a 12 o'clock. I t has a D shapes shaft. The flat spot of the shaft is at 11 o'clock. This is a replacement numbers PS2077264 , AP4088491, 12001510, 705437, Y704539, Y705137. Designed to fit specific Whirlpool manufactured range models including Maytag and Jenn Air. 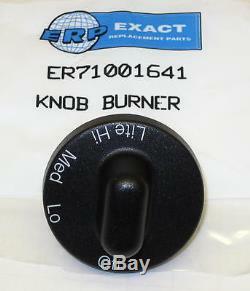 Send us the model number of your range and we can verify if this is the correct knob for it. Check out my other items. 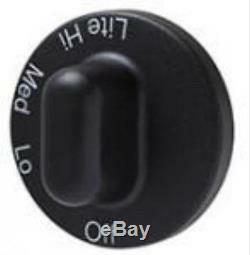 The item "71001641 for Jenn Air Maytag Gas Range Burner Knob Black PS2077264 AP4088491" is in sale since Wednesday, July 15, 2015.